THERE is palpable tension in Odighi community, Ovia North-East Local Government Area of Edo State, after suspected herdsmen killed two persons including Pius Eromosele, a Pastor attached to the Church of God Mission, in Benin City, the Edo State capital. 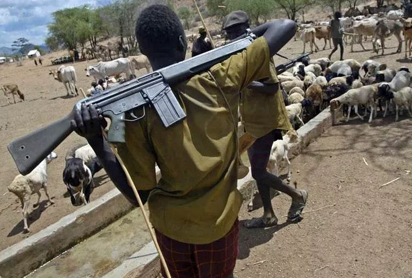 The pastor was said to have been allegedly killed by the herdsmen after a demand for the sum of N4million from him was not met, while another yet-to-be-identidied body was found in a shallow grave, in the farm. The decomposing body, suspected to be that of a farmer, was discovered when hunters and vigilante members went into the bush in search of the pastor. Eldest son of late Pastor Eromosele, Dr. Richard Eromosele, said his father was abducted on Thursday, March 29, and was found already decomposing in the bush on Tuesday, April 3rd. According to him, ¨I almost fainted when i saw how they brutally murdered my father¨ adding that the killers cut through his father´s skull after they shot him at close range. He stated that he reported the incident to the police and was referred to the anti-kidnapping unit but the police did not do anything to rescue his father. He further disclosed that two of his father’s workers, Kingsley and Akpan, who managed to escape from the herdsmen, narrated what happened before his father was killed. “Last (penultimate) Thursday, my mother called that she had been calling my father and that he was not picking. She later called that my father later picked and told her that he has been kidnapped by herdsmen at his farm. “The herdsmen did not use their phones. They were using my father’s phone and a phone of one of his workers. They demanded for N4m but we begged them that it was a holiday and could not raise such money. “I went to the police and they told me that I should call them whenever the herdsmen called for ransom payment. I did that but there was no response from the police. “The two workers that escaped told us that the herdsmen told my father that he was one of those killing their cows. “It was on Tuesday after the police failed to find my father that I begged hunters and vigilante to help me. It was during the search that we found my father. His skull was cut out with a cutlass, while his hands were also cut. “We want security agencies to protect farmers in Odighi. My father has farmed in that place for many years. How could I go into farming when my father was killed like a pig”, he lamented.